Cells across the tree of life use electricity to rapidly transmit signals. Ionic gradients generated across lipid membranes are used to maintain the beating of our hearts, to synchronise the fusion of sperm and egg during fertilization, and in the neural functions that produce our consciousness. Although these voltages are classically measured at the plasma membrane using electrodes, eukaryotic cells also contain internal membrane-bound organelles. Saminathan et al. have built a sensor capable of measuring membrane potentials in intracellular organelles inside living cells using DNA nanotechnology and imaging. A DNA based device to measure membrane voltages in living cells. Saminathan et al. term their DNA nanomachine “Voltair” (Fig. 1). 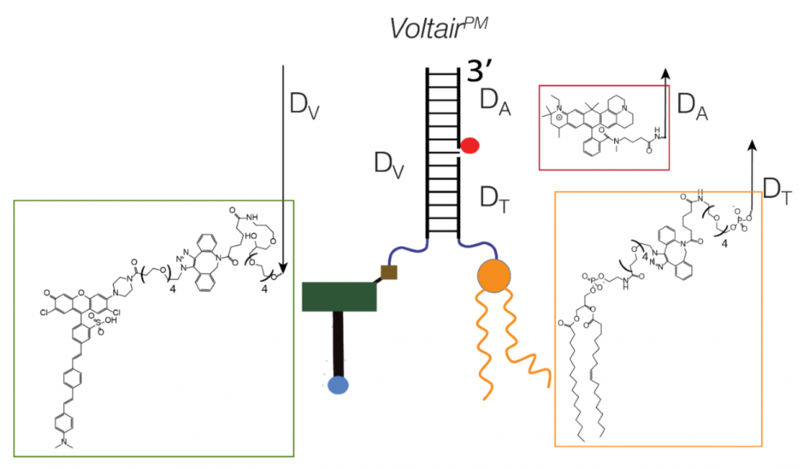 Voltair contains two different fluorescent dyes linked at 1:1 stoichiometry using a 38-base pair DNA duplex. The first dye, RVF, changes its fluorescence intensity as a function of potential difference changes along its axis (1, 2), and therefore acts as a voltage sensor. The second dye – Atto647N – is not voltage sensitive, providing a reference for normalisation of fluorescence intensity changes which are not related to voltage. As proof of principle, when whole cell membrane potential is clamped over a range of voltages, Voltair responds with linear changes in fluorescence intensity (Fig. 2). These ratiometric fluorescence intensity values were calibrated against membrane potentials, providing a device to measure absolute voltage in living cells. Fig. 1. Components of VoltairPM. VoltairPM is a trimeric complex comprising of voltage sensing strand DV, normalizing strand DA and targeting strand DT. DV is constructed by coupling RVF-N3 to DBCO-ispacer18-DNA. DA strand is an Atto647N modified at 5’ end of DNA. DT is constructed by coupling POPE-N3 to DBCO labeled DNA. These individual strands are assembled to form the complete sensor. Figure from Saminathan et al., 2019. Measuring intracellular membrane potentials in diverse cellular locations. Voltair has a modular structure (Fig. 1), allowing the attachment of different moieties able to target it to distinct cellular membranes. Coupling of 1-palmitoyl-2-oleoyl-sn-glycero-3-phosphoethanolamine lipid (POPE) to the probe inserts it in the plasma membrane. It can be trafficked through the endocytic pathway, or alternatively, targeted to recycling endosomes by an aptamer that binds the human transferrin receptor. Localisation to the trans-Golgi network was achieved by expression of furin fused to a single-chain variable fragment recombinant antibody which selectively binds a d(AT)4 sequence in the DNA duplex of the sensor. Thus, the attachment of different moieties which differentially interact with cellular structures allowed Voltair to report on membrane potentials in different subcellular locations. This showed that membrane potentials differ in different membrane-bound organelles, changing as a function of endosomal maturation in the endocytic pathway, or as a function of mTor localisation at the lysosome. Fig. 2. 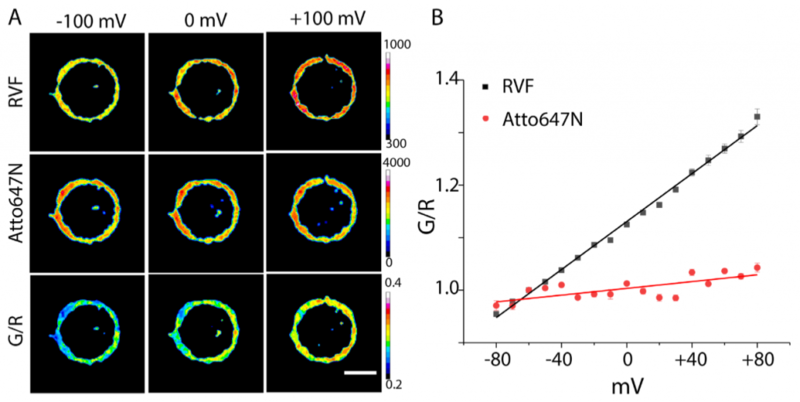 Voltage sensitivities of RVF and Atto647N in VoltairPM: A) Representative images of VoltairPM labelled HEK 293T cells voltage clamped from -100mV to +100mV, pseudocolored according to the pixel-wise fluorescence intensities of RVF (G), Atto647N (R) and ratio G/R. Scale bar = 10 µm. B) Normalized RVF (black) and Atto647N (red) intensities of VoltairPM labelled HEK 293T cells voltage clamped from -80 mV to +80 mV. Error bars indicate s. e. m. of N = 3 experiments. Figure from Saminathan et al., 2019. Eukaryotic cells are partitioned into membrane-bound organelles with distinct proteomic, chemical and functional composition. Voltair complements existing electrophysiological techniques (3, 4) for measuring membrane potential. As an imaging-based tool, it has the potential to be relatively non-invasive, allows the simultaneous imaging of cellular morphology, and is applicable to high-throughput measurements in populations of cells. Saminathan et al., 2019 show that different membrane-bound organelles have distinct electrochemical compositions. This preprint provides a tool with which to investigate further how membrane bound organelles exploit bioelectricity to regulate their function. What are the primary advantages of constructing the device around DNA? Could a similar sensor be realised with a different chemistry? Cells have elaborate mechanisms to recognise and respond to foreign or damaged DNA. Is it possible that these mechanisms are engaged when Voltair is introduced into a cell? Are there limitations which currently hamper the probe from being a generic tool able to bind any given cellular target? Miller EW, Lin JY, Frady EP, Steinbach PA, Kristan WB Jr, Tsien RY. Optically monitoring voltage in neurons by photo-induced electron transfer through molecular wires. Proc Natl Acad Sci U S A. 2012 Feb 7;109(6):2114-9. Kulkarni RU, Kramer DJ, Pourmandi N, Karbasi K, Bateup HS, Miller EW. Voltage-sensitive rhodol with enhanced two-photon brightness. Proc Natl Acad Sci U S A. 2017 Mar 14;114(11):2813-2818. Hodgkin AL, Huxley AF. Action potentials recorded from inside a nerve fibre. Nature. 1939;144:710–711. Lazzari-Dean JR, Gest AMM, Miller EW. Optical determination of absolute membrane potential. 2019. bioRxiv doi 10.1101/519736. Claudio Schmidli, Stefan Albiez, Luca Rima, et al. Vincent Mercier, Jorge Larios, Guillaume Molinard, et al. Kei Saotome, Bochuan Teng, Che Chun (Alex) Tsui, et al. Jayashree Chadchankar, Victoria Korboukh, Peter Doig, et al. S-acylated Golga7b stabilises DHHC5 at the plasma membrane to regulate desmosome assembly and cell adhesion. Mu A, Tak Shun Fung, Arminja N. Kettenbach, et al. Quynh Nguyen, Zhen Liu, Rashmi Nanjundappa, et al. Carol J. Hartley, Charlotte C. Williams, Judith A. Scoble, et al. Mikhail H. Hanewich-Hollatz, Zhewei Chen, Jining Huang, et al. Anand Saminathan, John Devany, Kavya S Pillai, et al. Quinn A Boser, Michael R Dawson, Jonathon S Schofield, et al. Carlo Bevilacqua, Héctor Sánchez Iranzo, Dmitry Richter, et al. Nicole Traeber, Klemens Uhlmann, Salvatore Girardo, et al. Jocelyn Y. Kishi, Brian J. Beliveau, Sylvain W. Lapan, et al. John K Eykelenboom, Marek Gierlinski, Zuojun Yue, et al. Elisa Dultz, Roberta Mancini, Guido Polles, et al. Hannah Harrison, Henry J Pegg, Jamie Thompson, et al. Alexandra Yin, Nathaniel R. Campbell, Lee W. Jones, et al. Mohsen Afshar Bakooshli, Ethan S Lippmann, Ben Mulcahy, et al. Che-Hang Yu, Stefanie Redemann, Hai-Yin Wu, et al. Ajay Tijore, Mingxi Yao, Yu-Hsiu Wang, et al. Simao Coelho, Jongho Baek, Matthew S Graus, et al. Evgeny Zatulovskiy, Daniel F. Berenson, Benjamin R. Topacio, et al. Anushila Chatterjee, Cydney N Johnson, Phat Luong, et al. Toshiaki Shigeoka, Max Koppers, Hovy Ho-Wai Wong, et al. Mark R Sullivan, Laura V Danai, Caroline A Lewis, et al. Xiaonan Zhang, Kaylynn Coates, Andrew Dacks, et al. Claudia Matthaeus, Ines Lahmann, Severine Kunz, et al. Jonathan P Gumucio, Austin H Qasawa, Patrick J Ferrara, et al. Hongxia Wang, Richard B. Dewell, Markus U. Ehrengruber, et al. Jessica Messier, Hongmei Chen, Zhao-Lin Cai, et al. Mathias Mahn, Lihi Gibor, Katayun Cohen-Kashi Malina, et al. 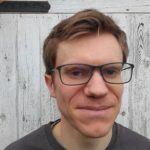 Dominik Martin-Creuzburg, Bret L. Coggins, Dieter Ebert, et al. Judy Martin, Erin Nicole Sanders, Paola Moreno-Roman, et al. Sara Molinari, David L. Shis, James Chappell, et al. Kwo-Kwang Abraham Wang, Tai L. Ng, Peng Wang, et al. Hannah A. Grunwald, Valentino M. Gantz, Gunnar Poplawski, et al. Kale Kundert, James E Lucas, Kyle E Watters, et al.